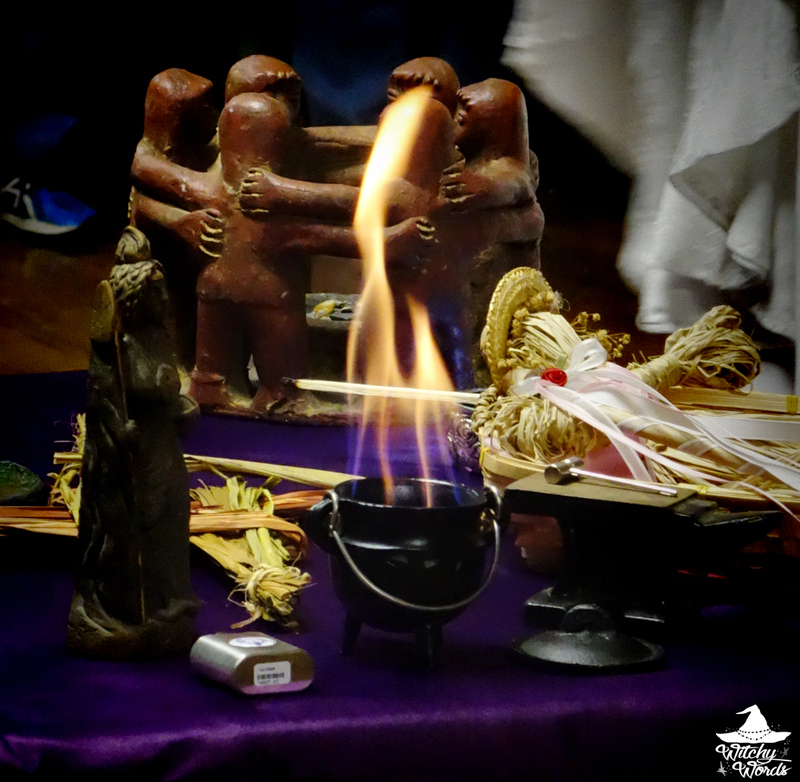 On Sunday, January 29th, Heena Lushede Coven held their public Imbolc ritual at Aquarius, our local metaphysical store and pagan hub. You might have noticed that this is not Liithi Lushede but have no fear! Heena Lushede is a planned hive off of Liithi Lushede, something that is a part of the Lushede tradition. You're sure to see some familiar faces in the process! This was the first ritual I've been able to attend since the hive-off. I had a terrible migraine on Samhain and Yule was an icy mess. Ideally, nothing else will prevent me from attending the public sabbat rituals this year, particularly since my circle is leading one of them! As we awaited the ladies of Heena Lushede to prepare for ritual, Barbara led us in some songs and chants for Imbolg. Strangely enough, many of them were also present in my circle's ritual that night as well. I always find it interesting when I see that kind of symmetry around the sabbats. Ritual began with Ripley casting the circle with the staff and a chant. She then created purified water from salt and water from a special place associated with the goddess Brigid. This represents a mixture of the elements earth and water. Ripley then combined the elements fire and air to create incense. This too was used to cleanse the circle in a clockwise motion, passed from coven member to coven member. The quarters were then called, beginning in the East and moving clockwise to North. 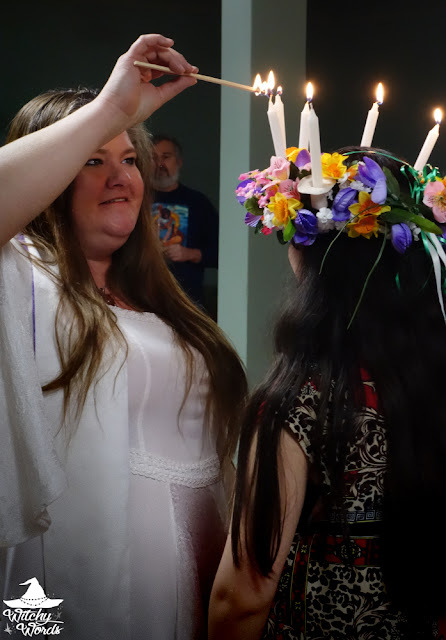 Ripley then called upon the "Goddess of the Sacred Flame, Maiden of the Snowdrop" and lit the cauldron upon the altar. Walking about the circle, Ripley discussed the meaning behind Imbolg and the significance of the goddess Brigid. Imbolg, she said, was a time of rebirth and fertility, a time of new life, of lambing and nurturing. As wands were passed to each attendant, the priestess stated that she believed each of us had something dormant within waiting to sprout to life. These wands were to represent that dormant seed. With that, Ripley handed her a basket with a straw doll representing Brigid. As the maiden walked the circle, we were asked to touch our wands to the womb of the doll, asking her to plant our seed and make it grow. Once returned, the crown was blown out. Cakes in the form of lemon cake and ale in the form of almond milk were then blessed and passed about the circle. With that, the maiden was released and her cauldron's fire smothered. ... And the circle was closed! Of course, there's much more to the public ritual than just the ritual itself. Public ritual is about community. Community announcements were made and a potluck feast were attended afterward, complete with a raffle! Of course, I couldn't stay for the festivities as I also had Circle of Fountains's ritual to attend. That being said, f you'd ever like to attend a Heena Lushede Coven public ritual or any of the other wonderful pagan community meets around Kansas City, check out the Kansas City Witches Meetup group for more information! A Joyous Imbolc to everyone!